People are getting so frustrated with social media. Some think it's the "magic bullet" and others think it's "bunch of hype" and a waste of time. And there are a ton of folk who "just don't get it." Well, it's really just a new marketing method. But people are overwhelmed and are running all over the place without a plan. Well, here's a Simple Social Media Starter-plan that you can do about 15 to 30 minutes a day and start to get more traffic and learn how to build your "tribe." Visit blogs that are in your area. See my blog roll (Pam's Fav blogs on the right hand side on this blog for ideas). Follow blogs you find interesting and have great content. Learn from them! Read blog posts, take notes, write comments, post comments. Posting comments gives you a virtual footprint. Makes you visible. Social media is about marketing and spreading your message. connections. But, first you have to engage and get a feel for it for real. If you do the above consistently, you'll develop quality relationships and it will increase your value and your following. I see so many authors who have this great idea to write a book. They get inspired and lock out the world for three to 12 months and write. Their words flow from their fingertips to the keyboard and after before you know - they have a manuscript. According to a publishing industry survey, 80 percent of Americans think they should write a book. And only two percent actually finish a manuscript. So you've finished writing the book. Now what? For more writers, they think it's about finding right agent or publisher. They then search the internet for agents or publishers and send out query letters. And then the rejections come in. They realize that no one wants to publish them without "proving" they that can publish and market own their book first. That's why the self-publishing industry (once called Vanity Press) has flourished! Everyone is a publisher. Traditional publishers want to know if you have real marketability and are willing to take the risk to publish yourself. To most writers this sounds crazy. They think that it's their great book traditional publishers want. Not so. They need authors who have a built-in audience. They need authors who know how to sell books. Bottom line. It's business - not personal. 1. You have at least $2,500 to $5,000 to invest in the project. 2. Your topic is a topic that is very "marketable" in a book. 3. You regularly support other author events, i.e. book signings and lectures. 4. You frequently visit bookstores, know what the trends are and know (and read) some of the best sellers. 6. You've published articles or regularly speak/lecture thereby you have an "audience" for your book. 7. You research and read books/magazines on publishing or go to writer's conferences or are apart of a writer's group - either online or offline. 8. You know a professional graphic designer, PR Coach, editor and webmaster - or at least know where to hire one. 9. You have a written marketing plan and know how you're going to sell your book- before you've written it. 10. You have at least 10 to 20 hours a week to promote your book and have money for a PR Coach. If you have answered "yes" to 7 or more of these questions, you are a good candidate to be a successful author. If not, you now have a guideline as to what to do before you start the publishing process. SEE EVENTS BY Solutions Driven Workshops| Click Here! Visit our PR Pro Shop for tools and tips for authors! Did you know Google is now a VERB in the dictionary? We don't go to the library to look up stuff, we "google" it. Google is pretty much running things. I always tell my clients, “If you’re not on Google, you don’t exist.” Well, although you may exist, you are invisible to millions! So, is your ministry, business or book invisible? 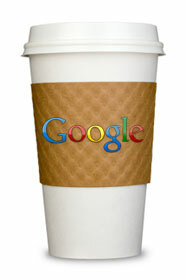 If you want to get out there and get noticed, the quickest way is Google. The Internet has changed everything and social media has changed everybody. We don’t go to the Yellow Pages for phone numbers or to the library reference desk for information anymore, we Google. Even when we’re looking up information about an author or ministry, we Google! 1. Set up a Google account. As well, set up your gmail account, youtube account and your blogger blog. It’s all done in Google because they own it all. Try not to leave anything blank. 2. Set up your “Google Profile” in your Google account. Make sure you include a photo, short bio, website links and all your social media URLs. Put in keywords that relate to your expertise. 4. Blog. If you are not blogging, you are missing out. It’s more than just an “online diary,” the blog is the “personality” of your online presence. You can add video, photos, reviews, and articles from other sources (you must get permission first). As well, you can link to things like your facebook badge and your other social sites streams from Twitter. (See http:// www.ministrymarketingsolutionsblog.com for an example). 5. Link up with the big three social media sites (for guaranteed Googleness! ): Facebook, Twitter and Linkedin. Facebook is a powerful place to build your brand and garner fans and friends. On Twitter, you can get tons of followers. Have your friends, fans, and followers meet you at your blog to really get to know you. If you are active, these social networking sites will rank you high in Google. The whole social media experience is just plain old networking on steroids. People do business with folks they know, like and trust. If you are transparent and au- thentic online you’ll quickly “grow” your base of friends, fans and followers. Final tip: Don’t sell or yell on social media. The key thing to remember is that it’s about listening first and then engaging. I see so many people on social media just yelling about themselves and selling their wares. No one wants to be friends with a salesperson. 1. Comment on blogs and videos. Give the author or creator some encouragement; thank them for the post and let them know what you got out of their content. 2. 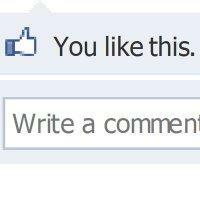 Retweet someone else’s twitter and “like” someone’s comment on Facebook. 3. Call in to a teleconference or blogtalk show and ask questions. 4. Bottom line: In order to get friends, you have to show yourself friendly. When you’re networking or marketing online, remember that people don’t care how much you know until they know how much you care. Keep the emphasis on “social.” It’s really about building relationships with people; not numbers. Now, what do you do to ENGAGE on social media? Are you just a "drive by" blogger or lurker? Tell me what you do in social media to be SOCIAL and how much time do you spend on it a week or day? My guest, Shama Kabani, in December on the Synergy Energy show! She rocks. Do you ROCK? I don't know if you saw the BET Special, Black Girls Rock! but it was the most inspiring thing I've seen on TV in a long time. World changers, history makers - NOW. But you know what? I rock. YOU rock. We all rock! So let the world know. Get out there. Market YOUR MESSAGE. Do your OWN PR. If you are "shy" - Get over it! Break out of the box and be BOLD! Know that you ROCK and the only way people will know your greatness is to let your LIGHT SHINE! 1. Have a marketing mentality. We are a brand. So what is your brand image? What are you portraying to the world? Is it an "A list" brand? What you believe you are on the inside will be broadcast on the outside. Do the inner work first. Know that marketing is not a dirty word! It is a way to connect with others and live your purpose, fulfill your dreams and be a blessing to others. So think of marketing as networking - you are meeting and greeting. Remember to represent yourself as a "celebrity" at all times -and you're sure to be treated like one. 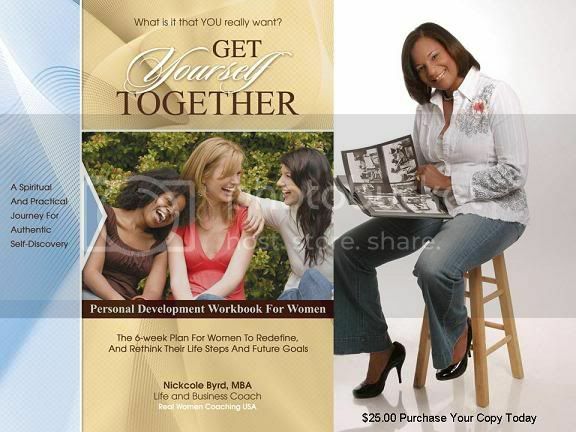 Examples: Oprah, Tyra, Beyonce, Susan Taylor and Dr. Stacia Pierce. 2. A bio and great head shot photo. Make sure you get a professional photo - and one that has YOUR personality imprinted in it. A real good photographer can help you with this. These are the tools of the pros. Write an authentic, interesting, short, snappy bio. A bio that will make people go, "WOW." Think of it as a intro to you to the world. What do you want people to know first about you? Imagine your bio being read at a big awards show like the NAACP Image Awards or Black Girls Rock. Hear the announcer introduce you to stage. How does it sound? Not a "wow"? Then redo it until you can hear the applause in your head. 3. A press kit. You need a package/portfolio of your achievements, press clips, broadcast interviews, articles you've written or have had written about you. Put in your brochure, your HOOK, fact sheets and any other signature items that make you who YOU are. Brand YOU. Add endorsements or testimonials. In order to get recognized faster, you might want to get an optimized online press kit. See http://tinyurl.com/pamperrypr and get the details on the Instant Media Kit to take your business, book or career to the NEXT LEVEL! 3. Invest in some coaching. Whether you need an image coach, media coach, internet marketing coach, PR coach or a life coach - in order to to be your best and be ready for the "red carpet," you need to get some professionals to help you. This will boost your confidence and this will make sure you don't make any costly MISTAKES! We have audio products, ebooks and group or personalized coaching programs to help you BRAND like a Superstar. Don't be cheap with your brand. Prepare for success. Since 2006, BLACK GIRLS ROCK! has been dedicated to the healthy development of young women and girls. BLACK GIRLS ROCK! seeks to build the self-esteem and self-worth of young women of color by changing their outlook on life, broadening their horizons, and helping them to empower themselves. For the past four years, we have enjoyed the opportunity to enrich the lives of girls aged 12 to 17 years old through mentorship, arts education, cultural exploration and public service. At BLACK GIRLS ROCK!, young women are offered access to enrichment programs and opportunities that place special emphasis on personal development through the arts and cooperative learning. By speaking to the next generation in their formative years about issues of self-worth, goals, and aspirations, the organization reinforces the message that young women need not objectify themselves or relinquish their autonomy. BLACK GIRLS ROCK! has boldly taken on the crisis of our female youth of color here in America head on and understands the need for positive self-images and a strong sense of awareness. WE SEE SOLUTIONS. LIVE YOUR DREAMS. MAKE A DIFFERENCE. What makes you ROCK? Post a comment. Special Events. They sell your book, position you as an expert and gets your buzz going. YOU gotta have 'em. But How do you get "peeps" in the seats? We often get asked “How can I leverage social media to promote my event?” So we started collecting best practices from event organizers who use Eventbrite. We pulled them all together in this post to help you get started down the path to social media glory. But it’s important to note that social media is a clunky gun, not a silver bullet—it’s a channel, not a strategy. The best way for each event to utilize this channel will vary depending on who the target audience is and how they engage online. It’s no silver bullet. That said, social media can be an incredibly powerful promotional tool, allowing you to reach more of the people that care about and ultimately want to attend your event. When people share information about your event with their network, that message carries much more weight than a traditional ad. It’s a personal endorsement of your event. Social media is also the perfect tool to generate buzz, to get people talking about your event in a recorded fashion where others can stumble across it and get caught up in it too. It’s not a new phenomenon. That’s how people have promoted their events from the beginning: get people talking about it. What social media brings is the ability for anyone to discover the chatter, giving it far more reach and power. 1. Choose the platforms that make sense for your event. There are a few options when it comes to promoting your event through social media, and each has unique advantages and disadvantages. For example, Facebook and LinkedIn show who’s attending and aggregate conversation about the event in one place, while Twitter provides the opportunity for anyone to discover the event. Building your own social network around your event may be the thing to do if you have an appetite for building a richly branded online experience, but it won’t give you the virality of established social networks. Look to strike a balance across several platforms—but most importantly, understand where your target audience is already engaging. Identify existing communities by searching on LinkedIn, Facebook, or other forums, monitor Twitter conversation, and locate the platforms that have the most activity. This is where you’ll want to place the majority of your efforts. 2. Define success metrics and don’t underestimate the effort required. To new users, online communities might look self-sustaining. They’re not. Facebook, Twitter and the rest all take work, ideally in the form of a dedicated individual who can keep dialogue flowing and seed productive conversations. Continuous new content and engagement tactics are required to grow the vibrant community necessary for achieving buzz around your event. Define success metrics so that you know how you’re tracking—number of fans or followers is a great place to start, but engagement metrics are most important. Facebook’s Fan Page dashboard gives good stats and there are some great free Twitter analytics tools (we use Twitalyzer) that can measure engagement levels of your tweets. 3. 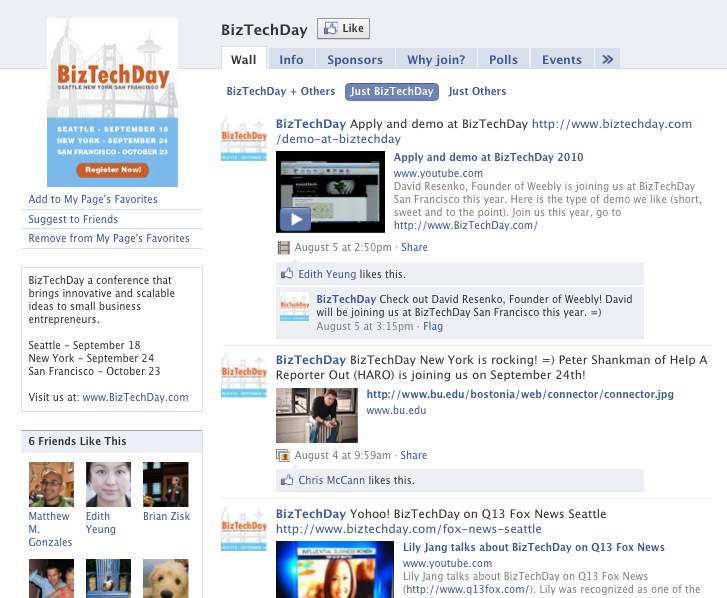 Publish your event to Facebook. From right within the Eventbrite management console you can publish your event to Facebook and it will automatically create a Facebook Event, pulling in all the event details from Eventbrite. You can publish the event as a stand-alone event created by your Facebook profile or as an event associated with a specific fan page. Facebook Events allow you to easily invite your friends and fans and it makes it easy for them to share with their friends. It creates a central location for attendees to begin to connect and share their excitement for the event. 4. Create a Facebook Page. For larger events a dedicated page may be appropriate as a central location to engage with attendees and people interested in learning more about your event. 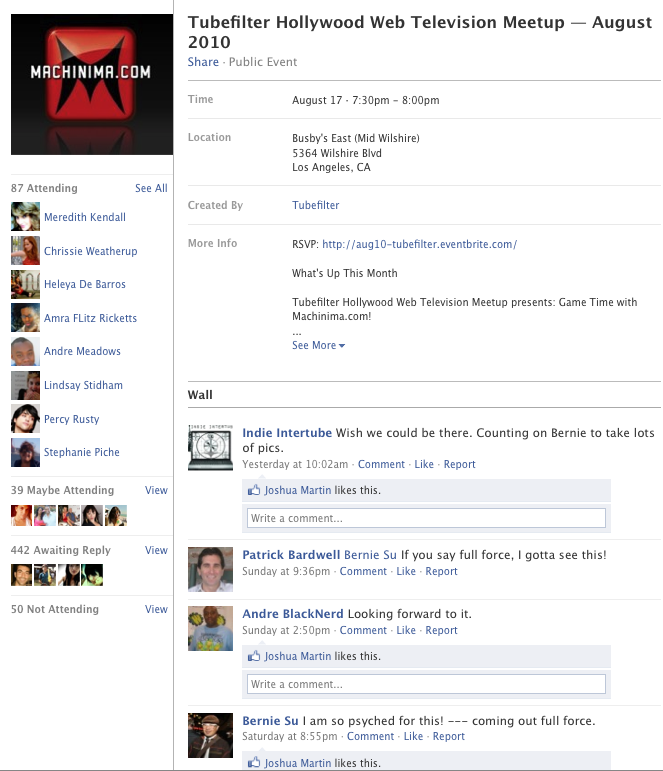 The best pages that we’ve seen post updates almost daily, giving fans a window into the planning process of the event. Have you just secured an amazing caterer? Has an exciting speaker agreed to attend? Has the event received coverage in the media? Multi-media is always compelling: if you can share photos of the space or get the main attractions (speakers, artists, etc.) to post quick videos on their thoughts for the event, it really helps to bring it to life. The Facebook fan page is not only a great way to get your attendees excited, but also to get them involved in the event itself by asking them questions that can influence the content or the agenda. You should also reach out to specific individuals who may be connected to your event topic or specific friends that you think would be interested. For example, say John is a big industry influencer. You can “Send John a Message” through the link that’s under his picture on Facebook. Again, be VERY careful to not sound spammy but instead let him know about an event that you think he would be interested in and why. Keep it short and include a link to your fan page encouraging him to be a fan and also a link to the Eventbrite page. You can cherry-pick these individuals to connect with, but the real value will come when he fans your page or posts that he is attending the event and his whole network sees it. Twitter, LinkedIn, and building your own community.